Displaying image 146 of 200 images in Physics. 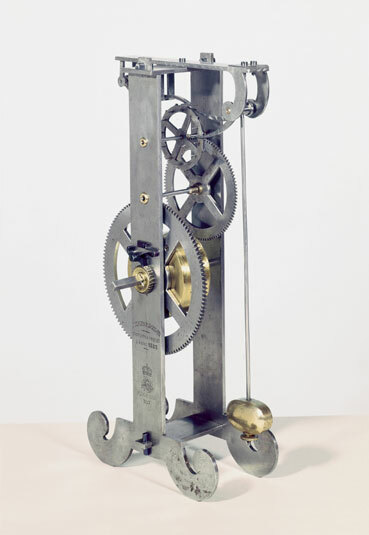 19th century model based on a drawing by Galileo's (1564-1642) friend and biographer, Viviani, of an incomplete pendulum clock which Galileo designed just before his death. It represents the first known attempt to apply a pendulum to control the rate of a clock. Galileo had noticed that the pendulum's period of swing appeared to be independent of the extent of the 'arc' of the swing and recognised its potential for timekeeping, but died before his work could be completed. It was Huygens (1629-1693) in the Hague, Holland, who built the first successful pendulum clock in 1656. The application of the pendulum to clock timekeeping during the scientific revolution of the 17th century was the most fundamental advance in the history of time measurement. The pendulum was partly constructed by Galileo's son Vincenzio in 1649. Galileo had observed that the time taken for a pendulum to complete one swing was almost independent of the arc through which it swung and he had used a freely swinging pendulum to time various astronomical events. He recognised the potential of using a pendulum to control a clock but died before his work could be completed.